"What do you do when you have always wanted your children to have a relationship with their grandparents but they are not around? They don't make time to call them, show up at holidays, or even send a card. We have made every effort to reach out to them in love but they just don't seem to want to invest in the relationship and would rather be out and about doing their own thing. It breaks our heart--not that they don't want to spend time with us--but that they don't want to have anything to do with their grandchildren. " I know that many of you might be blessed with wonderfully involved grandparents---they visit you every chance they get, with gift in hand and a smile on the face. Their welcoming arms are open wide and swing Johnny all around while they tell him just how much they missed him. It is a hard thing when grandparents are not involved, whether you have one child or many. The feelings of rejection, depression, sadness, and anxiety can all definitely play a part because of their absence. It can be especially difficult to keep moving on knowing how much they are missing out on that they will never get back. There are a million different reasons why a grandparent might not be in the picture. Reasons range from illness, to poor relationships, to busyness, divorce, and more. Sometimes, sadly, it might even be their own selfishness. Whatever the reason we hope that the following points will help you deal with the situation in a God honoring way. 1. Pray - Ask God for wisdom in your situation and guidance. There is no cookie cutter answer for every families distinct circumstances. Remember that you are dealing with real lives and feelings. God knows all the details, He knows the future, and He is sovereign. He has allowed this to happen for a reason and whatever the reason is, you know that you can trust Him. That is something that you can definitely rest in. 2. Find Contentment in God - It can be hard when there is that gap in your life of not having a loving grandparent available and that is why it is even more important to have peace in your circumstances. If God is a father to the fatherless, He can also fill that gap when grandparents are not around. Turn to Him in the midst of confusion, sadness, anger, bitterness, or loneliness and He will be your comforter. 3. Move Forward - This is important because sometimes it is so easy for us to become stuck. Especially when we know things could be better. Some people get stuck being bitter or resentful. Others have trouble living their lives to the fullest. Moving forward will mean something different for each person, it could mean reconciling relationships for one or maybe just forgiveness on your side or both. Sometimes there is nothing that you can do except accept the circumstances. If this is the case, I encourage you to fill the void that has been created by sharing the love of God (their heavenly Father) with your children and take heart that He will always be there for them no matter what. 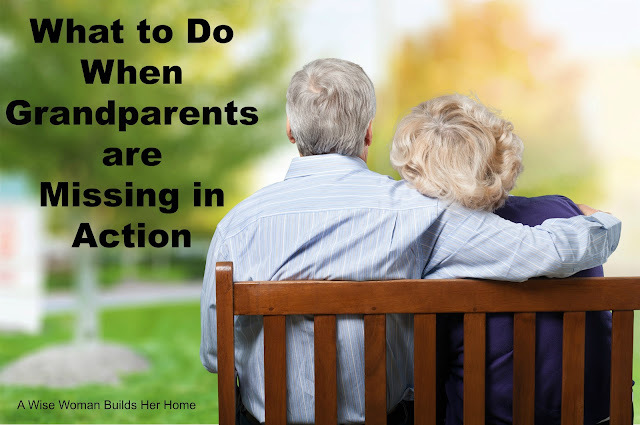 Do you have grandparents that are missing in action? Please feel welcomed to share your thoughts in the comments below. One suggestion is to find a "substitute" grandparent. Our children have wonderful grandparents who are involved, but they all live out of town. We contacted our church to ask if there are any elderly people who would enjoy some younger company once in awhile. The pastor gave us some names to choose from. We simply chose based on location, so we now visit a lady for an hour once a month whom we call "Grandma Doris." Our kids know that she is not their "real" grandma, but they still get to treat her like one with drawings, cards, prayer, and flowers, and she treats them like grandchildren - treats, hugs, prayer, and love. Our sons were adopted after our all four of our parents' deaths. They have lots of aunts, uncles and cousins from whom to learn the family stories. Our sons' Godfather has very elderly parents and they have, in many ways, become the boys' grandparents. it is a nice relationship. I have just the opposite situation. I have reached out countless times to my grandchildren but they never respond. I've called, sent card w/$ for birthdays, holidays and nothing in return from them for years now. I am to the point that I have given up on all of them. They are old now, 18 - 24 years of age, if I ever see them again that will be nice, if I never hear from them again, that too will be nice. I'm too old to beg for a relationship with any of them. I'm sure when I drop dead, they'll be the first ones at my ranch looking around to see if I left any of them a dime. Ungrateful, heartless, unthankful generation. Thank you for this post. I have a 7,5 and 3 year old. My parents don't know my children. Both have chosen to live different lifestyles that is not ok for children to be involved in. Both my parents have relationships with my siblings and there children. Hard but life goes and i have been so blessed to have my husbands parents and grandparents to be a big part of my children's life. Our daughters (2) grand parents moved to FL like over 2yrs ago,we live in MI. One daughtet is 12 the other 3,my husbands mom lives 3 hrs away,shevhas no car, our youngest ment her 1x. And as for my parents that moved to FL our youngest really didnt know them either. Breaks my heart,I know how important grandparents are,I didnt see mine alot but I spent nights with them and had time and memories with them. My prayer would be that a couple would come into our girls lives and adopt them into their lives and hearts as grand children. My advice would be to never say anything about it, ever. When we express our feelings in certain situations, we're only likely to drive the wedge in further. We cannot guilt someone into loving us or our children. We can pray, ask God to reveal to us if we need to make any changes on our part, and seek to adopt the elderly that may need a void filled themselves. Great post! Where my child doesn't have grandparents missing in action, she unfortunately has an aunt that is. It breaks my heart - both for my child and her relationship to her aunt, as well as the relationship I long for to have with my sister again. Your points listed are great encouragement, thank you so much for sharing them. Our situation is that my in-laws don't agree that we've had six children. For years, they have favored the older two only wanting anything to do with them. The next four have various health issues (nothing serious) so they want nothing to do with them as they aren't perfect in their eyes and have pointed fingers at us saying if we didn't have more children, then there wouldn't be the health problems involved. Sadly, they are very appearance oriented. They've made it clear many times that it's unfair to the older children to have more children as they deserve lots of attention. Mind you, we homeschool and don't do a lot of outside activities so our children get lots of time with us. We also have always made it a point to take our children out individually to spend time with them. My in-laws have different beliefs than we do about homemaking, homeschooling, being believers, and trusting God. We had to put up boundaries with them because their behavior had become destructible. Likewise, after my last pregnancy, they sort of decided to neglect all of these grandchildren and focus on another grandchild since that is this other couple's only one (my husband's brother's child). As for my parents, they live out of the country and my children see them once a year. It's sad for my husband and I to see our children without close relationships with their grandparents. I grew up with having very close relationships with my grandparents. I always wanted that with my children. I liked the idea above about adopting a grandparent. We might need to do that one.